Many students choose to study abroad in order to obtain better educational opportunities including more than 100,000 Turkish students who also prefer to go abroad annually, which amounts to $1.5 billion spent in total. ISTANBUL — One of the indicators that demonstrate a country's current level of development is the allocation to international education. According to an Organization for Economic Co-operation and Development's (OECD) study in 2011, 4.3 million students worldwide enroll outside of their country of citizenship every year. It is estimated that this number, which was 1.3 million in 1990s, will reach eight million by 2025. In terms of market capitalization, the revenues made from international students have already surpassed $170 billion. The countries that are favored for education have also changed. People who lived in developed countries preferred underdeveloped countries for their education until 10 years ago. Today, however, China, Russia, South Korea and Japan are among the most preferred countries. Turkey ranks among the top 15 countries that send students abroad. Deniz Akar, General Manager of the International Educational Fair of Turkey (IEFT), which helps nearly 10,000 Turkish students study abroad every year, said Turkish people have become more interested in graduate programs in other countries. He said that they expect record attendance to the International Education Fairs of Turkey (IEFT), which will commence on Nov. 5, adding that approximately 100,000 Turkish students go abroad to study every year. "Almost 1.5 billion dollars are spent for these students," Akar noted. Turkish students prefer studying abroad for their undergraduate and graduate educations and they mostly travel to the U.S., U.K., Germany, Sweden, the Netherlands, China, Malaysia, Hungary, Russia and Poland respectively. According to the report by the Institute of International Education, a non-profit organization, Turkey is among the top-10 in terms of countries that send the most number of students to the U.S. with 12,000 students that have traveled to study in the U.S. so far. It costs approximately $10,000 for a student to attend university abroad; however, total expenses can reach up to $20,000 annually. Considering that there are 30,000 students who pay more than $20,000 for their education, international education for these students costs $600,000 in total. The rest of the 70,000 students who are abroad annually spend over $10,000. Although Turkey and Poland host the least number of international students with only 1 percent rate among the OECD countries, Turkey has progressed itself in this regard in the past 10 years. The findings of the website Study in Turkey show that Turkey doubled the number of international students it hosted from 15,000 to 30,000 between 2006 and 2011. 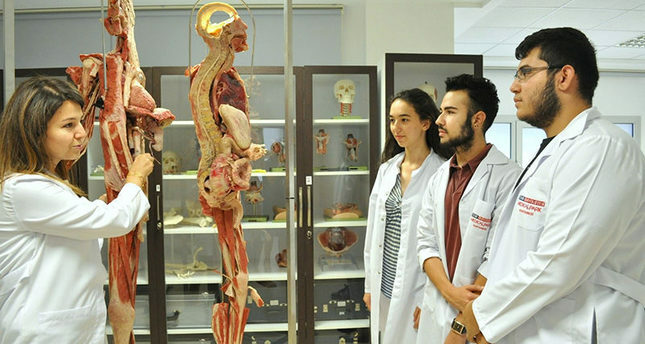 Azerbaijani students ranked first in the list with 4,200 students among 155 countries from which Turkey hosts students. The Azerbaijani students are followed by Turkmenistan with 4,100 students and the North Cyprus with 3,800 students. There has been a significant increase in the number of European students as well with Greece and Germany being the two countries that send the most to Turkey – 1,300 students in total.